The Court of Appeal has reserved till May 3, its order on the Writ Application filed by four Galle residents, challenging Galle District MP Geetha Kumarasinghe’s right to serve as a Parliamentarian, as she holds dual citizenship. The Attorney General (AG) informed Court this week that, Ms Kumarasinghe, who holds Lankan and Swiss citizenship, cannot hold her Parliament seat, as she had not renounced her foreign citizenship. Ms Kumarasinghe had obtained Swiss citizenship in September 2006. In 2015, she obtained a diplomatic passport which she is entitled to as a Parliamentarian. However, she had made a written request to the Controller of Immigration and Emigration not to include her dual citizenship status on her passport. The Controller had replied saying he had sought the advice of the AG, as her dual citizenship was being challenged in court, and had instructed her to prove that she has renounced her Swiss citizenship. The Appeal Court Bench comprising Justices Vijitha Malalgoda and Preethi Padman Surasena, allowed time till April 5for both parties to make written submissions, before a ruling is given on May 3. 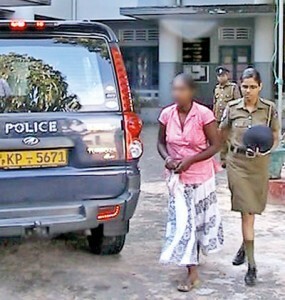 Two persons, who had allegedly helped the suspects behind the killing of five Kalutara prison inmates during an ambush of the prison bus on February 27, were arrested on Friday and brought before the Kalutara magistrate. Two persons who set fire to former UNP Anuradhapura District organiser Dr. Raja Johnpulle’s house, were this week sentenced to a 19 years 6 months RI, by the North Central Provincial High Court Judge Manjula Thilakaratne. The two convicted men are former UPFA Mihintale Pradeshiya Sabha member Anil Pushpananda and Nimal Gamini Jayasuriya. 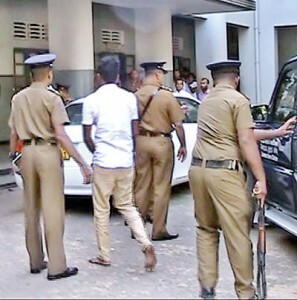 Earlier, six suspects were indicted on charges of unlawful assembly, trespassing on private property and arson, of whom three were acquitted, while one suspect Provincial Councilor Gamini Perera died during the trial. Dr. Johnpulle’s house was set on fire in August 2008, during the lead up to the North Central Provincial Council Election. The Gampaha High Court issued summons on Former Minister Basil Rajapaksa and Thirukumar Nadesan to appear in Court on May 3, for the alleged illegal acquisition of 16 acres of land in Dompe, Malwana. The Attorney General filed indictments against Basil Rajapaksa on charges of Money Laundering and Aiding and Abetting Money Laundering, under the Money Laundering Act. Meanwhile, the land, including a house, valued at Rs 290 million by the Government Valuer, will be sold by public auction on March 29, as the defendants had not claimed ownership of the property. It was a busy time in courts this week for several members of the Rajapaksa family . Former Minister Basil Rajapaksa was in the Colombo High Court on charges of Money Laundering, while former Defence Secretary Gotabaya Rajapaksa was at the Colombo Chief Magistrate’s Court in connection with the Avant Garde case. MP Namal Rajapaksa was also present at the Colombo Chief Magistrate’s Court in connection with a travel ban pending against him. His passport was impounded by Court, as part of the Magisterial inquiry over alleged Money Laundering charges. He was permitted to travel abroad by Colombo Additional Magistrate J. Trotsky, who temporarily lifted the ban till year end, enabling him to participate in a Football tournament organised by the Asian Lawyers’ Association, from March 22-29. Meanwhile, former President Mahinda Rajapaksa who was asked to be present at the Presidential Commission of Inquiry to Investigate and Inquire into Serious Acts of Fraud, Corruption and Abuse of Power, State Resources and Privileges (PRECIFAC), on Thursday, had informed he would not be available on that day. He has been asked to appear on March 24.